Bibimbap is a classic Korean dish with warm rice, sautéed vegetables, and eggs, all mixed together with a spicy Korean red chili sauce. Bibimbap (sounds like bi-bim-bap) is one of the most recognized of all Korean dishes, and easily my favorite! It can be served cold or sizzling in a hot pot, known as Dolsot Bibimbap. The main benefit to the hot pot is the crispy and crunchy rice. No matter how you like it, the preparation and ingredients are the same. The Korean word Bibim means ‘mixed’ and Bap means ‘rice’. So, Bibimbap is a bowl of warm rice topped with an assortment of sautéed vegetables that are mixed together with a smokey, sweet Korean red hot chili sauce. A fried egg and beef or pork are common additions to the bowl. After overindulging in Thanksgiving leftovers for days, it’s time for a low carb, healthier meal packed with veggies. 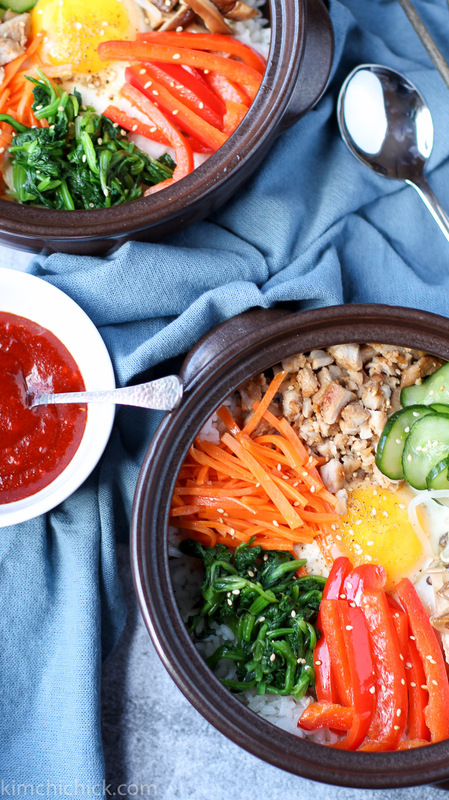 Bibimbap is a fun mix of many textures and flavors. You get crunchy from the vegetables, soft from warm rice, and smooth and runny from the egg. No two bites are ever the same! Cut the pork (or any protein of your choice) into 1/4 inch strips and add soy sauce, brown sugar, sesame oil, and chopped garlic. Combine well and season for 30 minutes while preparing the other ingredients. When it’s time to cook, add some cooking oil to a skillet and sear both sides of the pork for 2-3 minutes or until cooked through. Rough chop and set aside. This Korean red chili sauce is the most essential component of Bibimbap. Without this sauce, it’s just a bowl of rice and vegetables. 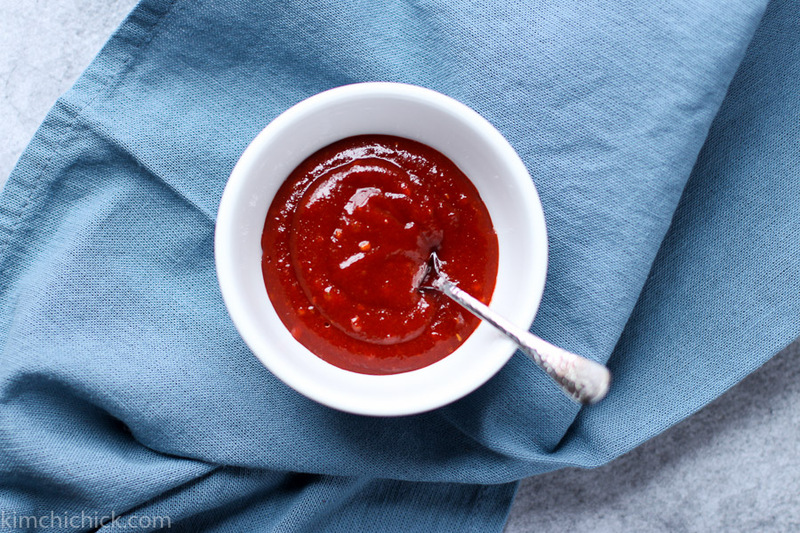 Mix together gochujang, sugar, chopped garlic, sesame oil, and water to make a thick, red sauce. It perfectly balanced with heat, spice, sweetness, and smokiness. 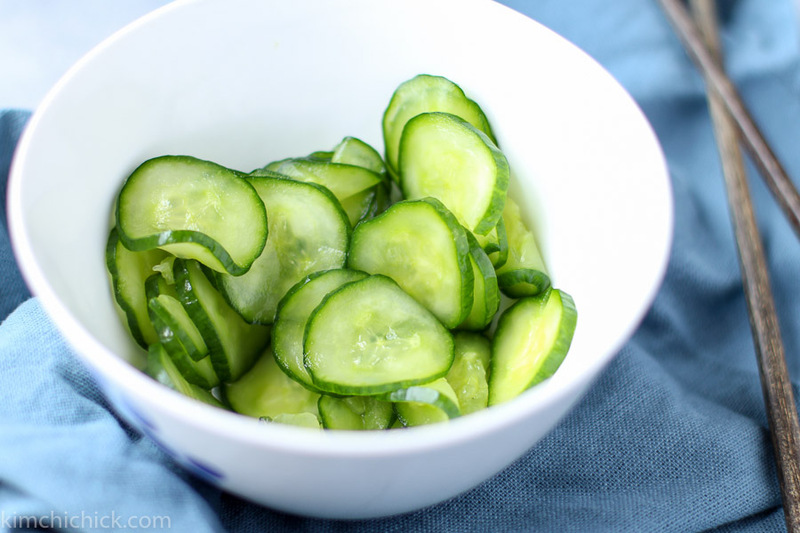 Cut an English cucumber into thin discs and quickly pickle by sprinkling with salt. After 20 minutes, rinse, drain and squeeze any excess water. Then set aside. Julienne the carrots into thin matchsticks. 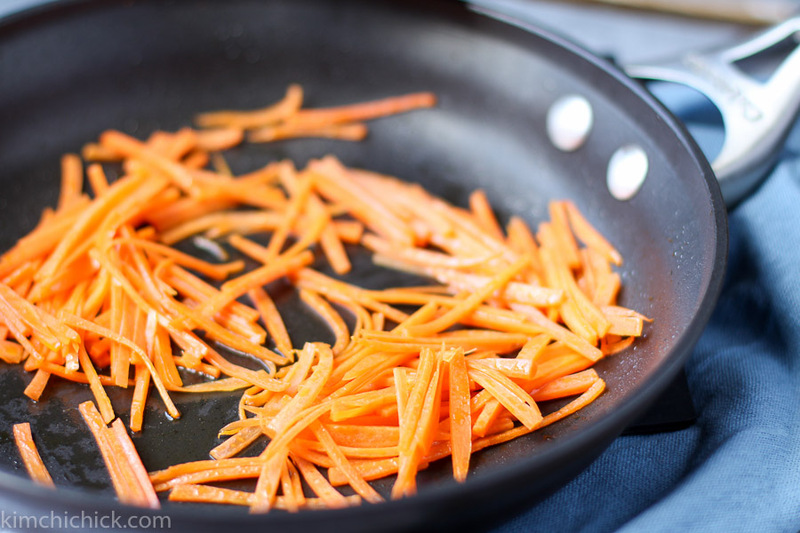 Heat 1 Tbsp of cooking oil in a skillet and add the carrots, a pinch of salt, and sautée for one minute. Take off heat and set aside. Rinse, core, and thinly slice the pepper into strips. 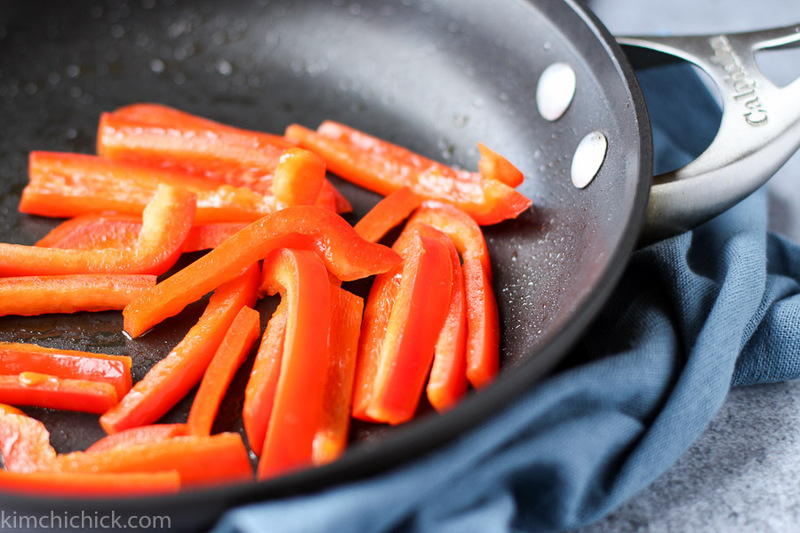 Heat 1 Tbsp of cooking oil in the skillet and toss the peppers for one minute. Take off heat and set aside. I always have dried shiitake mushrooms on hand so I rehydrate them in cold water overnight. If you don’t keep dried mushrooms in your pantry you can easily buy fresh shiitake mushrooms. Clean the caps, discard the stems, and slice thin. Heat 1 Tbsp of cooking oil in the skillet and toss the mushrooms for one minute to soften. Take off heat, season with salt, and set aside. 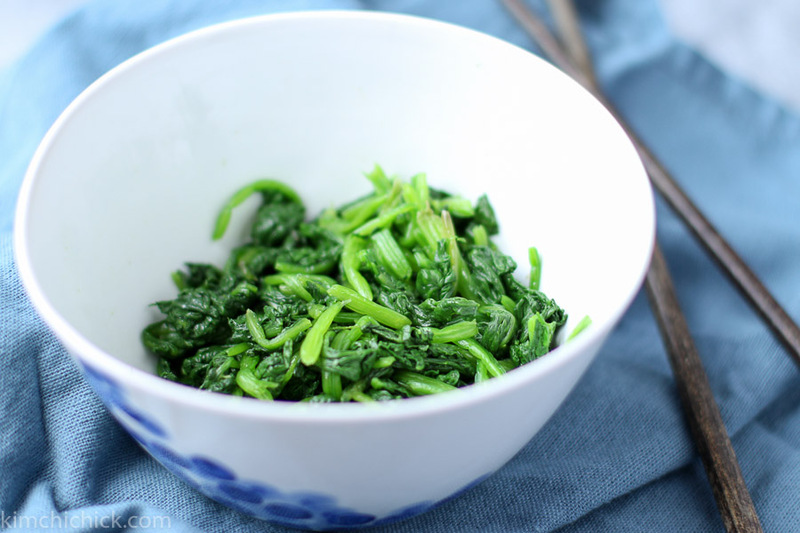 Take a bundle of whole leaf spinach and place in boiling water for 30 seconds to blanch. Once the leaves turn a beautiful forest green drain and rinse under cold water several times to remove any dirt. Roll the spinach into a ball and squeeze tightly to remove any excess water. Rough chop and season with sesame oil, chopped garlic, and salt. If you have any leftovers from my Fresh Korean Bean Sprout Salad recipe, then toss them into Bibimbap. If not, make a simple version by cleaning and rinsing the sprouts. Then sautée and steam on low heat for several minutes before rinsing and draining. 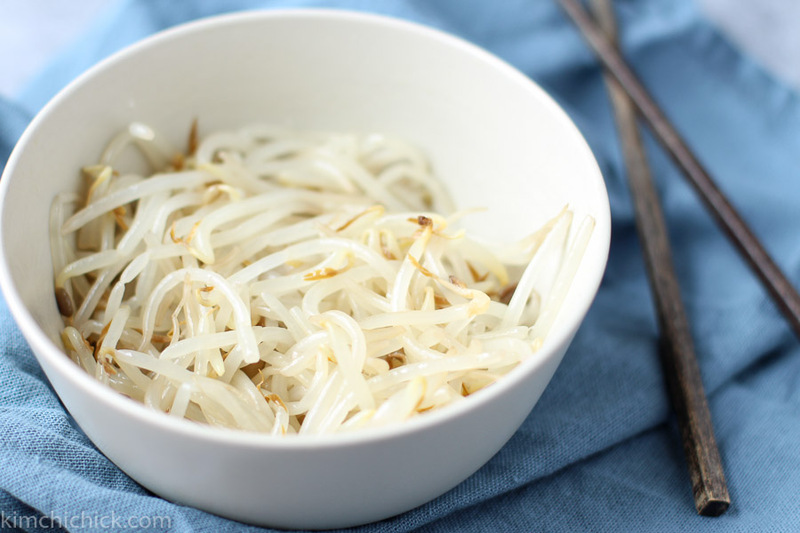 Toss the bean sprouts with sesame oil and salt. Line the bowl with a layer of rice and drizzle sesame oil. I add a fried egg on top and then assemble the veggies all around. But who says you can’t add your egg at the end? That’s fine too! 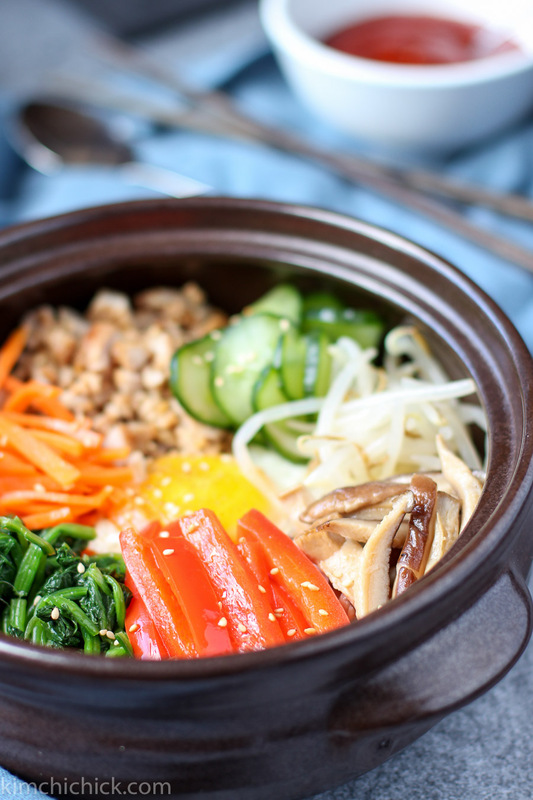 If serving the bibimbap in a Dolsot pot, place your cookware on medium high heat, drizzle sesame oil on the bottom before adding a layer of cooked rice and assemble the cooked veggies on top. Close the lid for 5 minutes and listen for that sizzle! I like my bibimbap really spicy, so I mix in 2-3 tablespoons of sauce. Start with a small dollop and liberally mix all throughout! You can always add more. For the Dolsot bibimbap lovers, stay tuned for a future Dolsot Bibimbap post! 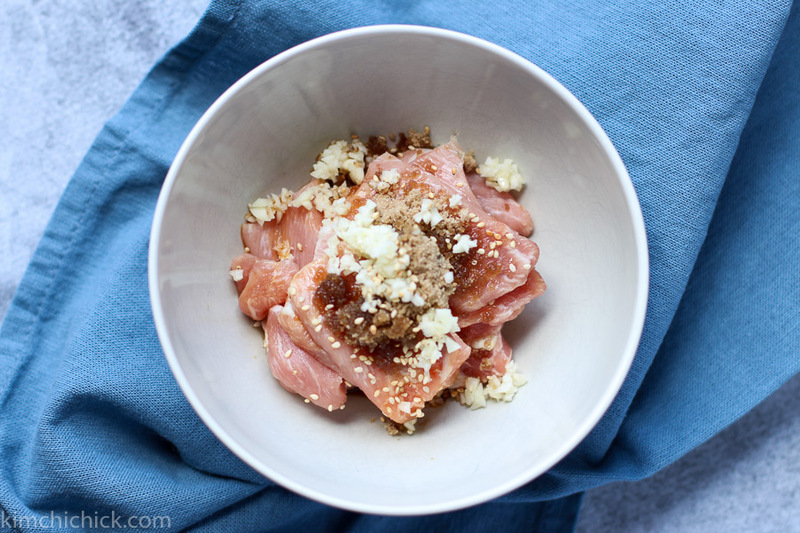 Slice pork loin into ¼ inch strips and marinate in soy sauce, brown sugar, sesame oil, and chopped garlic. Massage into pork and place in refrigerator while preparing vegetables. After 30 minutes, heat skillet with 1 tbsp of vegetable oil and sear pork 2-3 minutes on each side until cooked through. Allow it to cool and rough chop. Mix together the gochujang, sugar, chopped garlic, sesame oil, and water until it forms a thick, uniform sauce. Set aside. Rinse the cucumber and slice into thin discs. Sprinkle ½ tsp coarse salt and massage. Let sit for 20 minutes until the cucumbers soften. Then rinse under cold water, drain, and squeeze tightly to remove any excess water. Set aside. Blanch spinach for 30 seconds and immediately drain and rinse with cold water several times to remove any dirt. Squeeze spinach into a ball to remove any excess water. Rough chop and add ¼ tsp coarse salt and ½ tsp sesame oil and mix together. Set aside. Clean bean sprouts by removing thin long tails and discarding any brown caps. Afterward, rinse under cold water, drain, and add ¼ tsp sesame oil and ½ tsp salt. Mix well and set aside. Rinse and slice thin into strips. 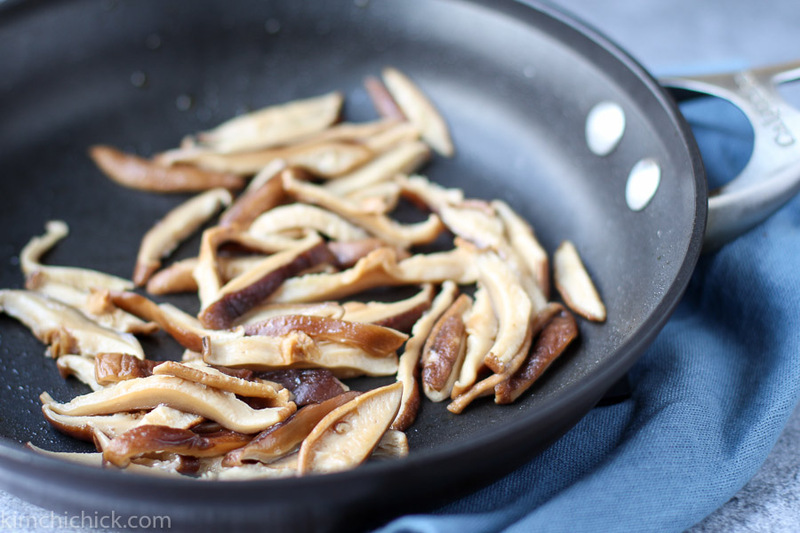 If using dried shiitake mushrooms, place in cold water overnight to rehydrate. For fresh shiitake mushrooms, clean caps and remove stem. Slice caps into thin strips. Add 1 Tbsp vegetable oil to pan and saute mushrooms for 1 minute. Remove from heat and add a pinch of salt. Set aside. Peel the carrots and julienne into matchsticks. Heat 1 Tbsp vegetable oil and saute carrots for 1 minute until soft. Remove from heat and add a pinch of salt. Set aside. that’s such an awesome tip! Thanks for being so creative and sharing with me! You’re right, most people have cast iron skillets at home so this is a great DIY tip for that perfect rice 🙂 kudos!